The Librariá occitana (Occitan bookshop) first opened in Limoges in 1984. It has been run by the Institute for Occitan Studies in Limousin (Institut d’Estudis Occitans dau Lemosin) since 2000. Films, clothes, plenty of gadgets (stickers, key-rings, flags,…) and Occitan-labelled products (for example Cerva d’Òc, beer made in Occitania). 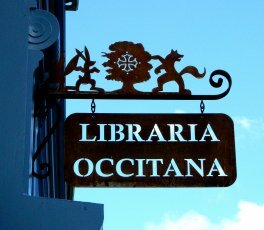 The Librariá occitana is a place where to find information about and the beginning of an immersion in the Occitan language and culture thanks to all sorts of events such as exhibitions, evenings, book-signings. You are welcome ! Selling all over the world. Try it ! The Independent bookshops in Nouvelle-Aquitaine association. The Librariá occitana is « point libraire ». You want to buy a book on-line ? Buy it on lalibrairie.com and come to fetch it at the Librariá occitana !